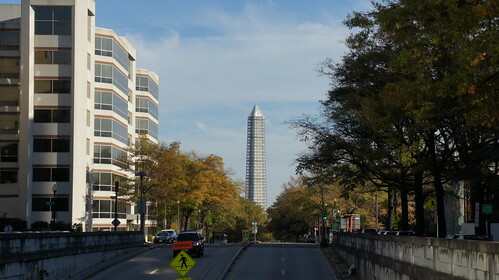 The Washington Monument has been wrapped in scaffolding for repairs over the last couple years following the August 2011 Virginia earthquake. 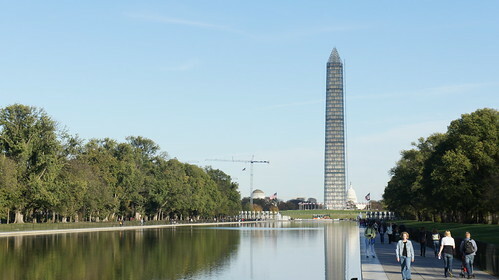 With the scaffolding due to come down, I dropped by the National Mall last weekend to get some photos, as the scaffolding itself does have its own visual charm. As I walked east from Lincoln Memorial down the Reflecting Pool, the clouds and sun were both behind me, occasionally casting moody shadows on the Monument. Down by the Monument itself, the Sylvan Theatre was right outside the fenced-off restricted zone, and I snuck through backstage to get a panorama from the stage. 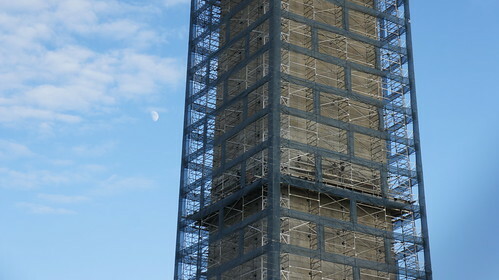 Before the clouds got too thick I was also able to get a closeup shot of the scaffolded Monument with the daylight-visible moon, somewhat reminiscent of this photo I’d gotten in 2007. At the time of this writing NPS is closing out repairs and has started to dismantle the scaffolding. 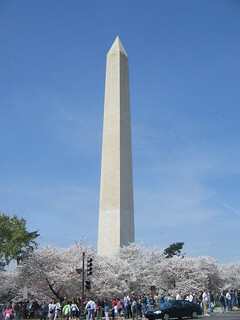 It’s been an interesting visual treat but it’ll be nice to have the Monument back in its full naked glory. Some time I need to actually go up in there; I’ve lived in the area over a decade now and still haven’t been to the top. 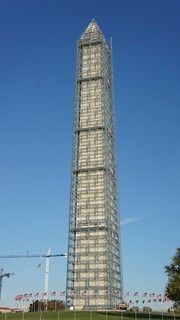 Full photoset on Flickr: Washington Monument in Scaffolding.